Step into a traditional Japanese restaurant and there is every chance you will be in for a meal of a lifetime. Order anything from the menu and you will have the real master chef prepare the dish right in front of your eyes. Try out some of the tastiest recipes you will have every seen, and all that remains is to decide whether to eat in or take away. Eye-catching dishes will always be just a spin away, so just pick the ones that look appealing and get rewarded for your “troubles”. It really is a win-win situation. 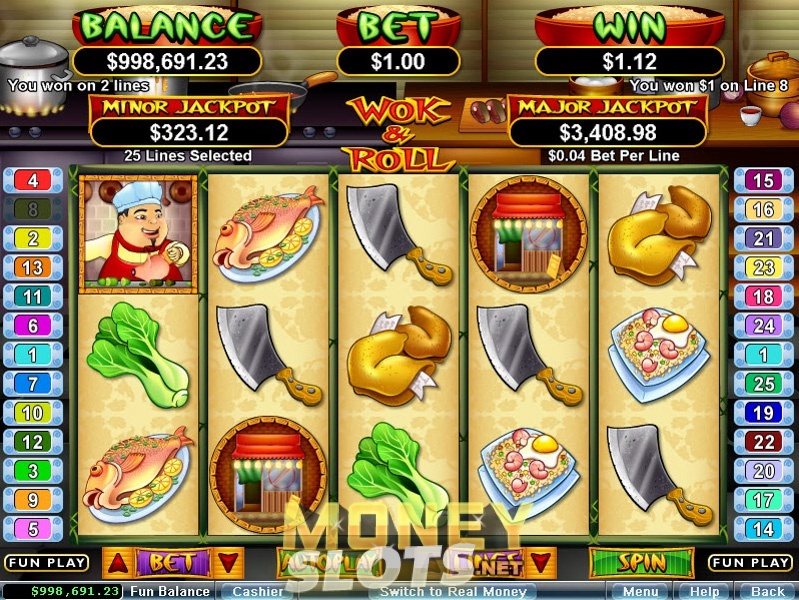 At first glance, Wok & Roll might seem as a standard 5 reel and 25 payline video slot, but that is not entirely true. Yes, the game features wild and scatter symbols, two bonus rounds and as many progressive jackpots, but it is the colourful symbols that really make a difference here. You may encounter winning and losing streaks, but the Japanese restaurant setting should keep you entertained every step of the way. Wok & Roll restaurant is the latest trendy place in town, and you just cannot afford to miss out on all the fun. Pay a visit to a genuine sushi bar and try spring rolls, dim sums, rice, buck choy and many other tasty dishes. Don’t forget to order a fortune cookie, as it could inform you that you have just won one of the number of rich prizes the restaurant owners have prepared for their beloved customers. Wok & Roll slot offers a wide range of betting options, with coin sizes ranging from $0.01 to $5, and it gives you an opportunity to bet 1-25 paylines. Chef symbol acts as Wild and it replaces all other symbols except the scattered Wok & Roll logo. Scatter is the only symbol that pays any, with others paying left to right. Three or more scattered Wok and Rolls activate Wok & Roll feature, which includes eight free games and multipliers ranging from 2x to 10x. The same number of scattered Chefs triggers the Chef Feature. As a result, you get 10 free games, while all prizes are doubled when Extra Wild substitutes any other symbol in a winning combination. Chef Wild symbol not only substitutes other characters but also pays handsomely and triggers Chef Feature bonus round. The more time you spend on the reels, the bigger your chances of hitting one of two progressive jackpots. Look out for the Extra Wild symbol during Chef Feature, since it can double your wins by finding its place in any winning combination.